Unlimited storage, no decisions on what to back up, no pressure... Cool. If you're not sure what you want to back up, or where it is, or just don't want the pressure of trying to figure it all out—Backblaze is the online backup service you want. It offers unlimited storage, and backs up everything except items you explicitly exclude. Given all that, it's ridiculously inexpensive compared to the competition—check out all our reviews in our online backup roundup. There's not a whole lot to the Backblaze interface, at least if you don't want there to be. 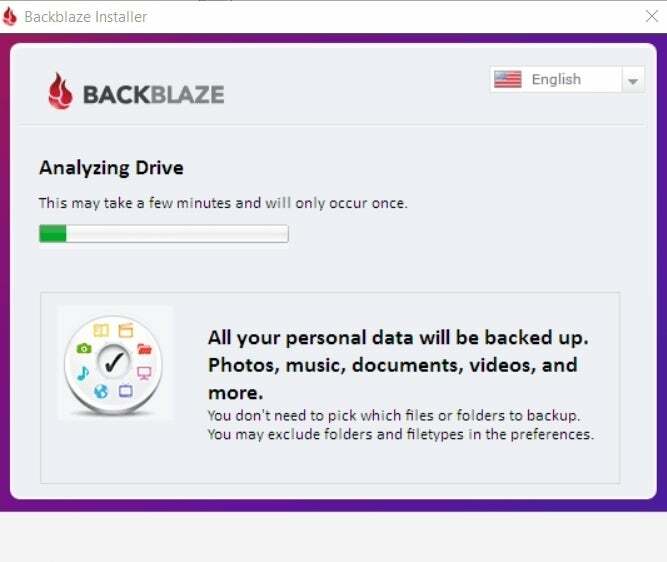 Backblaze backs up just about everything by default. We deselected many files so we could test the service in a relatively sane amount of time. 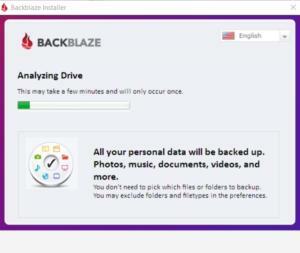 Because Backblaze starts at square one by backing up pretty much everything except known temporary files, you don't have to bother it unless you want to adopt a more selective approach. Then you can actually pick and choose what you want to back up in detail. There are several methods to get your data back. If they send it to you, there's a charge, but it's refundable if you send the device back. 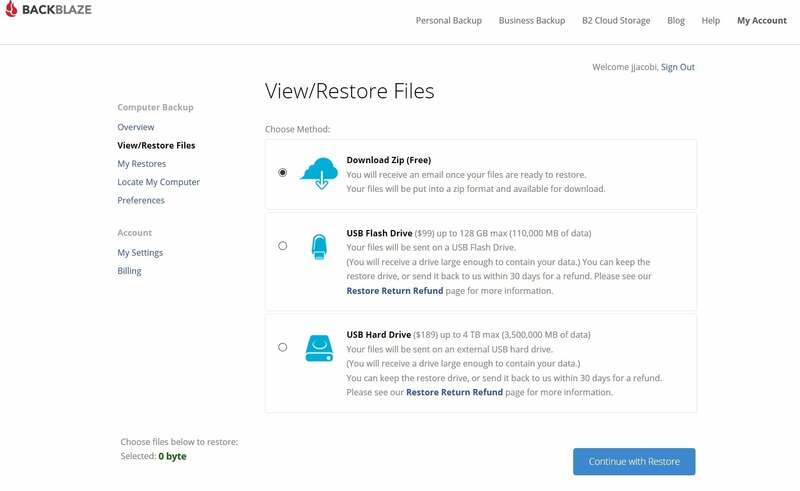 When and if it becomes time to restore, you can of course do so via the web, but if that's too slow, Backblaze will also send you your data on a 128GB USB stick for $99, or a 4TB hard drive for $189. You can also return the media and get your money back if you don't want to keep it as an archive. We're guessing they hope you keep it, though the service is not ludicrously more than the bare media. In keeping with the keep-it-simple-stupid philosophy, Backblaze is $5 a month, $50 a year, or $95 for two years for unlimited storage. Per PC. That's it. It's the same for business PCs. Say what? 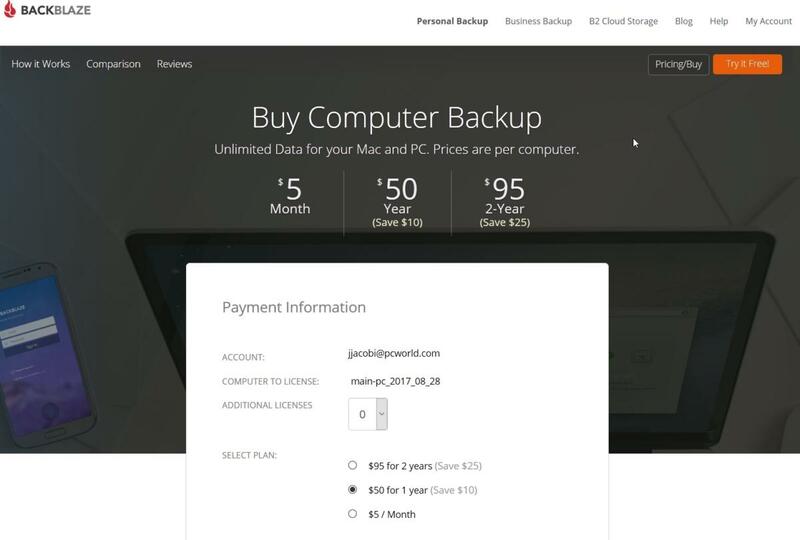 Backblaze's pricing is simple and the same for home and business. Given the amazing pricing and unlimited storage, we're not sure how Backblaze makes money. But the company assured us it does so by using a rather unique and inexpensive "pod" storage system of their own design. Not having toured the facility, we'll have to take them at their word. But if they all of a sudden can't hack it, you'll undoubtedly have a long grace period to retrieve anything you need. Keep in mind that while sharing and online access to your files are provided, Backblaze is really for backup. Older versions of files are kept for 30 days, then the company assumes you're done and deletes them. Historically speaking, the easier backup is, the better chance it'll actually get done. We know of no simpler, more foolproof online backup service than Backblaze. The fact that it's insanely cheap doesn't hurt, either. Download it, install it, forget about it. Until you need it, at any rate. Recommended.